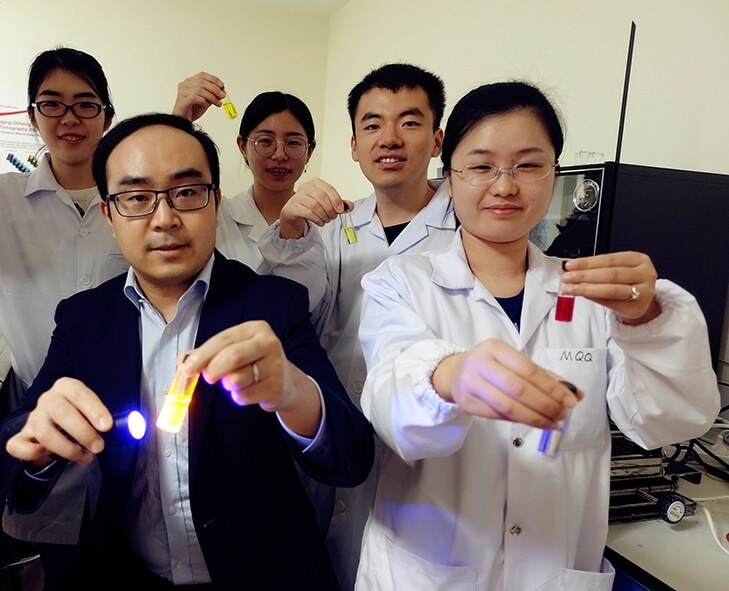 ​Polymer nanoagents capable of ‘lighting up’ small areas of diseased tissues that standard methods fail to detect, have been developed by a research team headed by Nanyang Technological University, Singapore (NTU Singapore). The nanoagents, called ‘semiconductor polymer nanoparticles’ (SPNs), have the potential to store light energy from sources such as near-infrared light, sunlight or even light from mobile phones, and this is followed by emitting long-lasting ‘afterglow light’. The research team from NTU Singapore customized greatly sensitive SPNs in order to track down and then lock on to diseased tissues present in the body such as cancerous cells, sending back near-infrared signals which are received and then interpreted by conventional imaging equipment. Doctors and scientists have more time to analyze test results, as the nanoagents continue self-illuminating and their light intensity reduces by half only after six minutes. On the other hand, if stored at -20 oC, the sample will be able to maintain its results for a month, thus becoming more convenient for other diagnostic experts to understand and review the results at a later time. The method, when tested in mice, provided results 20 to 120 times more sensitive than existing optical imaging methods and 10 times faster in screening diseased tissues. Unlike standard optical afterglow agents that aren't as bright and comprise of rare-earth heavy-metal ions that are toxic to biological cells, the newly developed nanoagents are also biodegradable, organic and made up of biologically benign ingredients that are non-toxic. The research has been published on the 16th of October in the scientific journal Nature Biotechnology. It could lead to prospective applications in image-guided surgery and also in monitoring the effects of drugs that are looking for regulatory approval. The new polymer nanoagents we have designed and built show a great deal of promise for clinical applications. They can detect diseased tissue much faster than current optical imaging techniques, and are much safer to use. We hope this may lead to technology that allows doctors to diagnose and treat patients much earlier than is possible at present. Potential use may be in image-guided surgery, where surgeons could use the technology to help them precisely remove diseased tissues in real-time, and in monitoring the effects of drugs that are seeking regulatory approval. It is also possible to use the technology for evaluating the behavior and therapeutic outcomes of drugs in the body, for instance, whether drugs induce liver damage as a side effect. Drug-induced liver damage is considered to be one of the most common reasons for which the US Food and Drug Administration refuses drug approval. Assessment of potential damage before regulatory approval is challenging because at the moment studies carried out in a controlled environment outside of a living organism frequently have low predictive power of how the drug reacts within the organism. Existing methods just track this activity at the tissue level while the new technology operates at a molecular level, monitoring decreased or increased levels of biomarkers in order to determine how the drugs are functioning, before completing their therapeutic action, thus providing much higher predictive power for drug development. The study was performed for two years and a patent has been filed for the technology. The research team now intends to execute further trials in larger animal models. The research team was made up of researchers from the National University of Singapore and the University of California San Diego.